(2016). Preconcentration of Cu(II)with magnetic nanocomposite sorbentsprior to determination by Flame Atomic Absorption Spectrometer. International Journal of Bio-Inorganic Hybrid Nanomaterials, 5(2), 129-139.
. "Preconcentration of Cu(II)with magnetic nanocomposite sorbentsprior to determination by Flame Atomic Absorption Spectrometer". 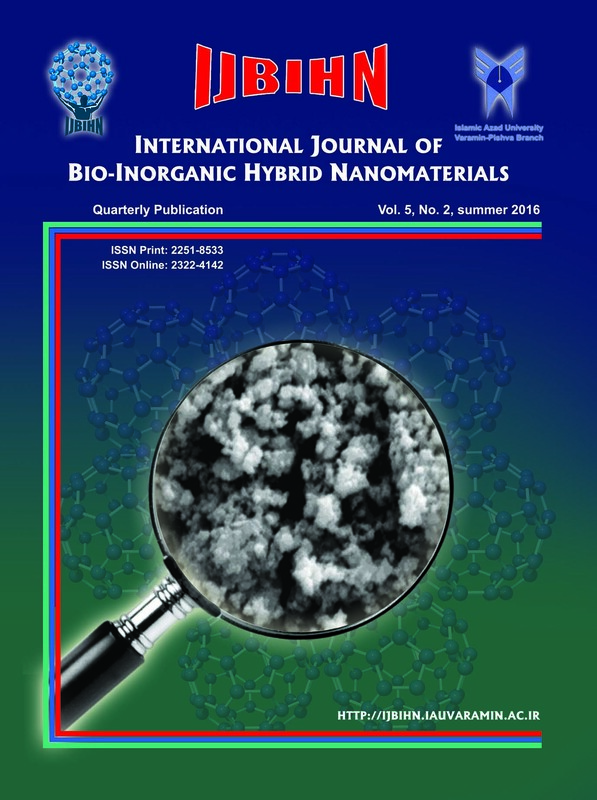 International Journal of Bio-Inorganic Hybrid Nanomaterials, 5, 2, 2016, 129-139. (2016). 'Preconcentration of Cu(II)with magnetic nanocomposite sorbentsprior to determination by Flame Atomic Absorption Spectrometer', International Journal of Bio-Inorganic Hybrid Nanomaterials, 5(2), pp. 129-139. Preconcentration of Cu(II)with magnetic nanocomposite sorbentsprior to determination by Flame Atomic Absorption Spectrometer. International Journal of Bio-Inorganic Hybrid Nanomaterials, 2016; 5(2): 129-139. A simple, highly sensitive, accurate and selective method for determination of trace amounts of Cu2+ in water samples .In this paper, Chitosan was used to encapsulate nano-Fe3O4 and produce a nano-Fe3O4-CHITOSAN sorbent based new sorbent was prepared. This was treated with ethylenediamine (ED) in another solvent-free procedure for the formation of a novel nano-Fe3O4-Chitosan-ED.Flame atomic absorption spectrometer was utilized for determination of Cu(II). The analytical features for sorption were found to be 5.2; 4.3 mL min-1 and 55.0 mL for pH, flow rate and sample volume, respectively. HNO3 was used as eluent and maximum preconcentration factor was found to be 200.Elution parameters were also determined as 4 mL min-1; 0.6 mol L-1 and 5.1 mL forflow rate, eluent concentration and eluent volume, respectively.Limit of detection and limit of quantification were found to be 49.6 and 163.7 ng L-1, respectively. Validation of the developed method was performed using certified reference material (TMDA-53.3). The methodology was applied for determination of Cu(II) in natural water samples and satisfactory results were obtained.